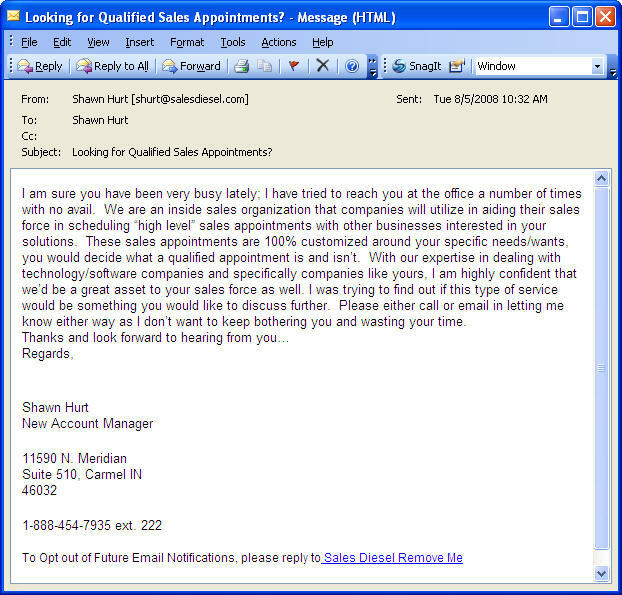 Shown below is an email I got yesterday (unsolicited I should say) from a company called SalesDiesel (this is a real company, they have a website and indeed do what they claim in this email). So why do I have an issue with this? 1) The email is addressed to himself and is not a personal email which means he has BCCd a ton of people. 2) This means that he has not tried to reach me at my office a number of times (not that I am complaining) – a big fat lie. 3) Does the email look professional to you that he thinks I will respond to this wanting to place my inside sales in their hands? 4) I have to call or email him so that he does not bother me or waste my time – you already have by sending me an email with lies and you want me to waste more time so that you shall not bother me? Why don’t some companies in this day and age just get it? Why do they think prospects are stupid and will not see through such a charade? Kristin Zhivago has written a great blog post : Salesmen talking : The 7 worst mistakes that is worth reading. ‹ PreviousDoes a vendor being #1 matter to buyers? When my clients ask me about this tactic I simply ask them this question: “How many emails did you open from someone you didn’t know or a company you didn’t recognize?” They all admit that they don’t or wouldn’t. They admit that it is most likely spam sitting in their in box and flag it as such. It usually ends the discussion. I never read or write on anyone’s blog. If I am going start doing that, I thought I might as well start with yours. I really like yours mainly because it is short and to the point. Your funds has been slated to be paid to you in America. Let me know if you are in America so that I can keep you posted with more informations. I have noticed spams of this kind has names of African countries associated with it. I also remember seeing a cnbc show hosted by chris hanson on scam artists in Europe, and they were from around the same region. I feel sorry for the real and hard working guy named Kwame from Ghana who in his heart wants to be banker. I think you have it confused. These are not “salesmen” (a sexist term anyway), they are spammers. You don’t think the kind of thinking goes into these scams that goes into true sales from reputable companies, do you? This did not come from IBM or P&G. Same with the African “bank letters.” They’re akin to the automated phone calls that start out “Don’t hang up, you have already won–” at which point I hang up. Hi gopal, it’s no longer new for me. I’ve been receiving such messages for how many times and I keep ignoring them. And it could really lead me to be so bad at times when it just keeps coming back. But anyways, don’t let yourself be scammed with anyone. If it is just sales, then call it then sales. But if it scam, you know what it is already. Unfortunate part is that even good “email marketing” (something that provides value to the customer) is now considered spam. So when companies do send out such emails to their potential prospects, I am not sure what their thinking is. For all you know, this could be one stupid salesperson doing this, but still it amazes me how some companies have their head in the sand when it comes to marketing. I particularly enjoy the “opt out” link in a spam email you didn’t request in the first place. I get a number of these a day. I think the use of “email marketing” — now with such delightful phrases as “blasts” and “opt-out” — is dead for any company that wants to take the high road. If you don’t know them and they don’t know you, don’t email. Marketing is about demytifying and conveying to your prospects and customers how and why you can be of benefit of them. It’s not about some lazy, ill-mannered sales rep (or entire department) using a frictionless medium to send out a non-specific message to anybody they could find who has an email address. THanks for posting this AND for not protecting the guilty (company or rep’s name). there is a chance you’re in his database and he actually DID attempt to call you, along with others on a list given to him, or a listing of search results. Many times, the next step in the sales proces is to send out an email or letter. @AnecdotalHumor: Maybe, I am in the database – but that does not give a salesperson the right to send a generic email like this – very unprofessional. Ahh, spam. Just delete it (or mark as spam, if your email gives you the option). Who has answered this msg? What is the real quality of these “set appointments”? Ever thought of returning the favor by sending a blind msg about a new career change…. I have done work for this company, although not as an employee, and I am shamed to admit that I, in my own way, assisted Salesdiesel. I hate spam as much as the next person, and for that, I am sorry.